I, ________________Please Print________________ , the undersigned citizen of the United States of America, do pledge with my fellow citizens to legally register and vote in all local, state, and national elections for the rest of my life. I consider the bipartisan power struggle between Democrats (DNC) and Republicans (RNC) a threat to the freedoms gained by the Declaration of Independence and later defined in the Bill of Rights under the Constitution of the United States of America. Special interest money donations to the DNC & RNC two-party monopoly rob our citizens of equal political representation within legislative bodies and executive branches at all levels of government. I must withdraw wholehearted support from all Democratic Party and Republican Party establishment candidates. I pledge to help elect qualified populist nonpartisan and minor party candidates to every local, state, and national public office in order to provide equal representation under the law to all living natural citizens. We will fire establishment bipartisan incumbents. Occupy Elections and Congress. (City, Village, or Township) in the State of _____________________________ . at (City) _____________________ , (State) _____________________ . interests shared by 99.999% of our citizens. Not the 0.001 of 1.0%! Main Street - Not Wall Street Billionaires! is given to Common Sense II Political Reforms by Email. Please use "CSII Link Notice" as the Email subject. We seek links to nonpartisan political web pages. 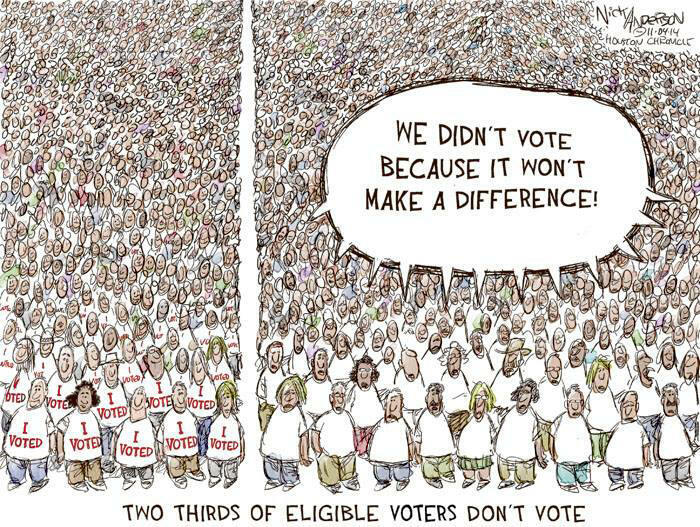 The Truth About Voter Apathy ― 66% Don't Vote! Nick Anderson Editorial Cartoon used with the permission of Nick Anderson, the Washington Post Writers Group and the Cartoonist Group. All rights reserved. Said Nick, On November 04, 2014, In This Editorial Cartoon. Support Nick Anderson, Best Editorial Cartoonist Ever!! !